Weston provided design support and elements to create unique amenity spaces using the GreenGrid green roof system with aesthetic and environmental benefits to attract tenants in the highly competitive private student housing market. Weston provided design support to increase the value of and reduce costs associated with a unique rooftop amenity space for Ball State University in Indiana. Converting from a traditional built-in-place, layered green roof system to the modular GreenGrid system, made installation of the green roof faster and more efficient, while also providing a more mature system to be enjoyed by the building occupants immediately after installation. Weston’s added value distribution of hardscape accessories, like concrete pavers and planters saved the developer money. 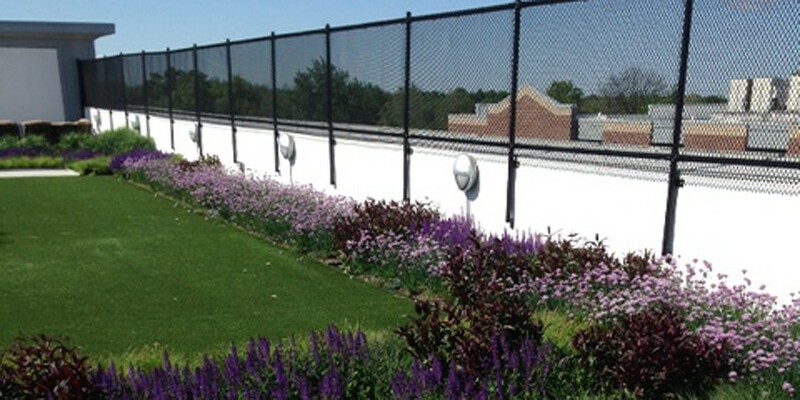 Weston also provided the synthetic turf system that was seamlessly integrated into the modules and pavers to provide students with one of the “coolest” rooftop common areas in their university community. The developer was so pleased with the results of the project that Weston’s GreenGrid system and accessory products were selected for their next student housing project in Illinois, with expanded areas of vegetation, multiple synthetic turf installations, and a number of custom planters. As this developer quickly realized, the GreenGrid vegetative solution increased tenant occupancy, improved lease rates, provided pleasing views for occupants, managed stormwater runoff, and reduced energy costs.